True Justice Season 2: Angel of Death DVD Review Both these films (and due to their length and pacing they feel markedly more like films than episodes of a TV series) are plenty of fun and surprisingly accomplished. Calling Steven Seagal prolific is like referring to a tornado as a bit of a breeze: in short, something of an understatement. Between the release of 2002s Half Past Dead and his appearance in the Robert Rodriguez film Machete eight years later, Seagal released more films than Warren Beatty did in his entire 5-decade career. Admittedly his modestly budgeted straight-to-video outings like Submerged and Belly of the Beast didn’t have the impact of, say, Bulworth, but they were fun, watchable and often well-crafted affairs that satisfied the seemingly insatiable desire of Stevie’s fans for new material. Now aged 60, the once ponytailed action master shows few signs of slowing down. The star of his own reality TV show, a volunteer sheriff’s deputy, newly married and with the usual slew of films on the way (including the intriguingly titled Gutshot Straight, which will see him starring as a character named Paulie Trunks), Seagal has also found time to produce and star in a series called True Justice. Comprised of movie-length ‘episodes’ the series revolves around Elijah Kane (Seagal), a former special forces operative recruited by the CIA to undertake rogue missions they cannot be seen to officially sanction. Together with his team of hot-heads and hotties Kane undertakes a series of covert missions, which usually end with him employing his own unique brand of ‘interrogation’ ie. kicking and karate chopping bad guys in the face. 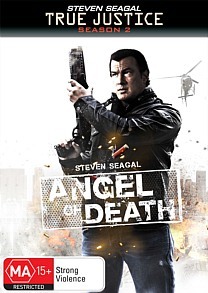 The episodes I was given for review are Angel of Death and Dead Drop, which are episodes 4 and 5 of the second season respectively. I’d seen a couple of episodes from Season 1 but nothing from the current season. Given that Angel opens essentially mid-scene with Kane and a wounded Sarah in some kind of safe house, I’d worried that this might be something of a problem - thankfully, however, there’s just enough exposition and even a helpful flashback or two to allow viewers to pretty much pick up the series where they left off. Angel of Death sees Stevie and his loyal team of operatives hunting for a suitcase packed with nuclear weapons - I don’t to spoil the surprise, but they find it. After kicking a lot of bad guys in the face, obviously. In Dead Drop Kane becomes concerned that his mole inside the CIA is conspiring against him, probably wanting to subject him to an interrogatory face-kicking (although this isn’t actually depicted in the film), and he also continues to track the suitcase nukes in an effort to stop them reaching their intended buyers, whose faces he will probably kick in a follow-up episode. Both these films (and due to their length and pacing they feel markedly more like films than episodes of a TV series) are plenty of fun and surprisingly accomplished. The action sequences are expertly staged, thanks to some clever editing and good use of stunt doubles who can actually lift their legs off the ground - I personally can’t recall haven’t seen Seagal perform one of his own kicks for going on six years now. 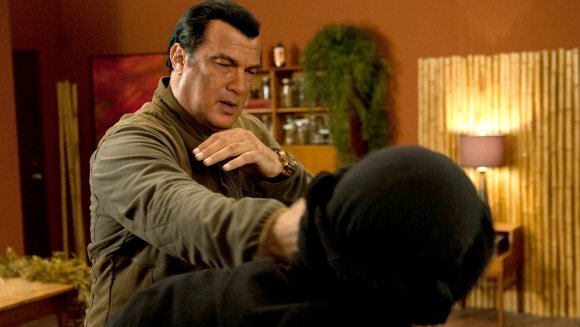 The themes and dialogue get a little rote at times (dodgy Russians, cops named Johnny, stolen nukes, etc) but the performances are really good here, especially that of Seagal’s luscious sidekicks, played by Sarah Lind and Tanaya Beatty - Beatty in particular deserves to go onto bigger and better things. Stevie fans won’t be disappointed - there’s plenty to like here. Looks surprisingly slick for a series shot on digital with time, money and the need for speed ever-present factors. The 16:9 transfer is crisp and Keoni Waxman’s cinematography is punchy and immersive. The soundtrack is a potent and defect-free DD 5.1 on each episode. There are no extra features, subtitles, trailers or audio options. Bare bones.